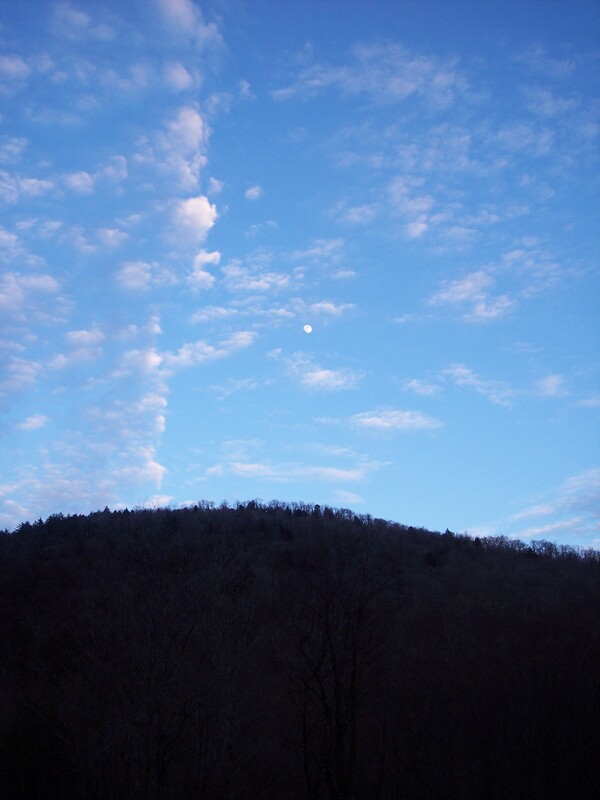 I first visited the Moosic Mountain preserve about four years ago. 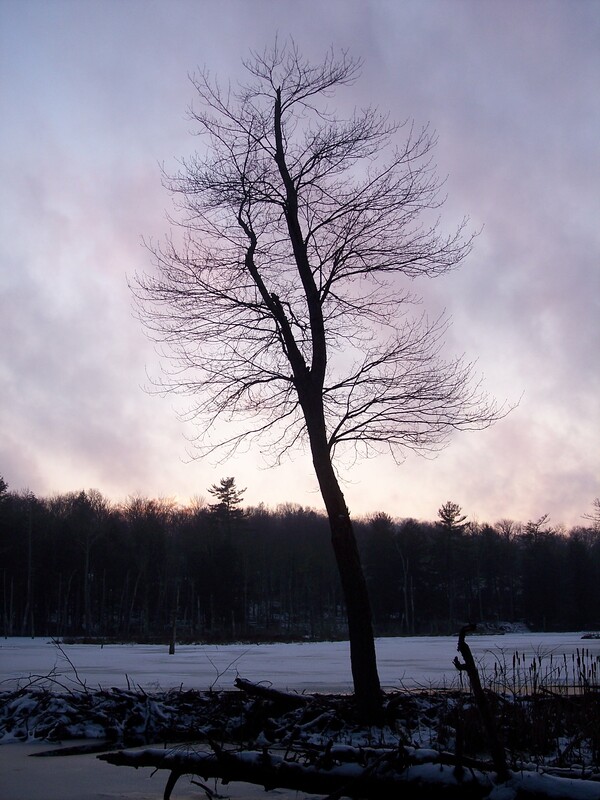 The preserve is owned by the Nature Conservancy and protects some of the finest heath barrens in the northeast. These barrens are home to two rare species of moths and feature stunted forests of pine and oak, along with rhodora, huckleberry, and blueberry. The preserve also has more mature woodlands; it covers a total of 2,250 acres. The preserve is now laced with many trails and is a prime destination for mountain bikers. The trails meander through woods, across meadows and along the barrens while dodging rock outcrops. The trails are generally easy to moderate, although they can be rocky and wet. The preserve is an odd place. First, it was going to be turned into a business park, and some of the infrastructure had been put into place. There are a few gravel roads the trails interconnect with and old ditches and ponds for storm water retention. However, the views are simply beautiful. 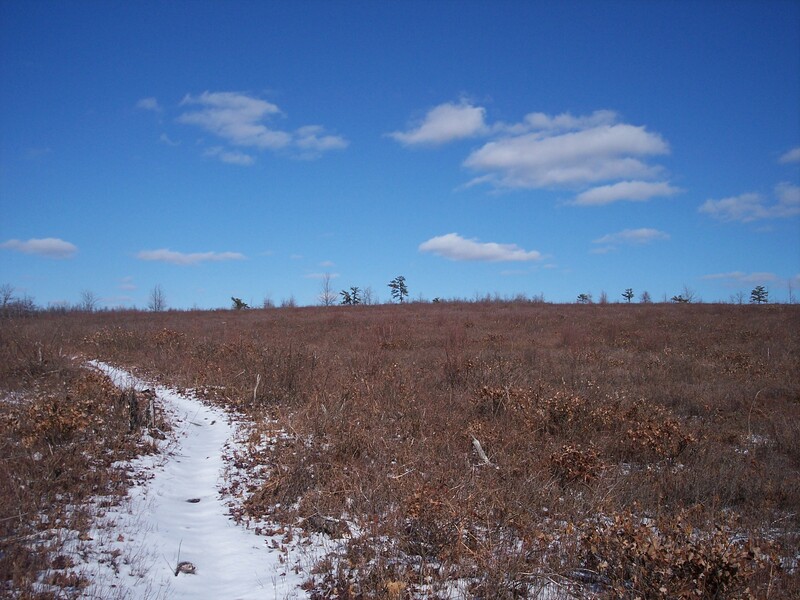 We began on the Blueberry Trail as it meandered wildly across a burned meadow; there are controlled burns at the preserve to maintain the barrens. The trail entered the woods and passed a neat bubbling spring before returning to the meadow. Mountain biking trails tend to meander crazily, so we left it and hiked the perimeter of the meadow to a gravel road. I noticed an unmarked trail to the right that seemed to climb through a larger meadow, so we took it. 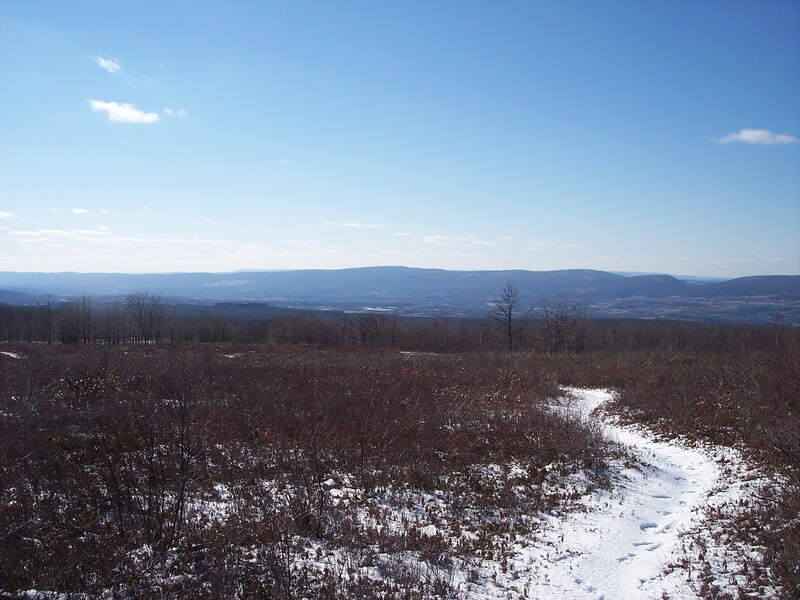 The trail climbed up the meadow, offering amazing views across the Lackawanna Valley and northeast Pennsylvania. You could probably see for 20 or 30 miles. You could see the ridges and the high plateaus beyond. Unfortunately, I did not know where there is unofficial trail went to, so we retraced our steps under a deep blue sky and bright sunshine. Without a map, I wasn’t sure where to go next. We followed another gravel road, turned on a trail, and turned on another unofficial trail that passed a bog that looked more like a canal. We soon returned to the car. 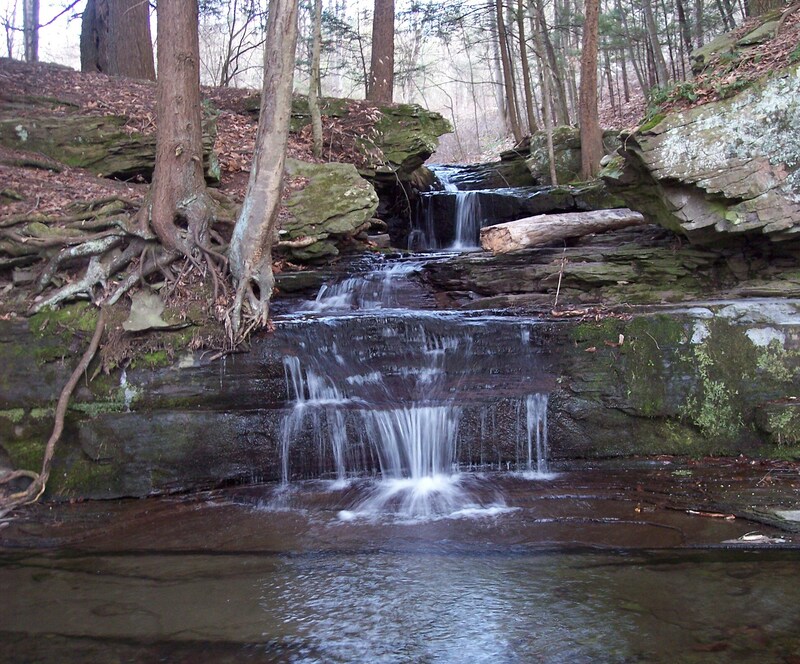 I plan to come back to the preserve and hike more of its trails, which feature rock outcrops, a waterfall, pond, and forests of hardwoods and pine. For more information about the preserve, including a trail map you can download, click here. For pictures from my September, 2007 hike, click here. This past weekend I visited the D&H Rail Trail at Simpson. I was surprised to see a few inches of crusty snow. As a result, my goal to explore the waterfalls of the Panther Creek Nature Preserve was nixed, so we took a walk along the rail trail. Pennsylvania has more rail trails than any other state, and although the D&H is not one of the more famous ones, it is still very nice. The trail follows the Lackawanna River closely; the river is small, really the size of a large creek. 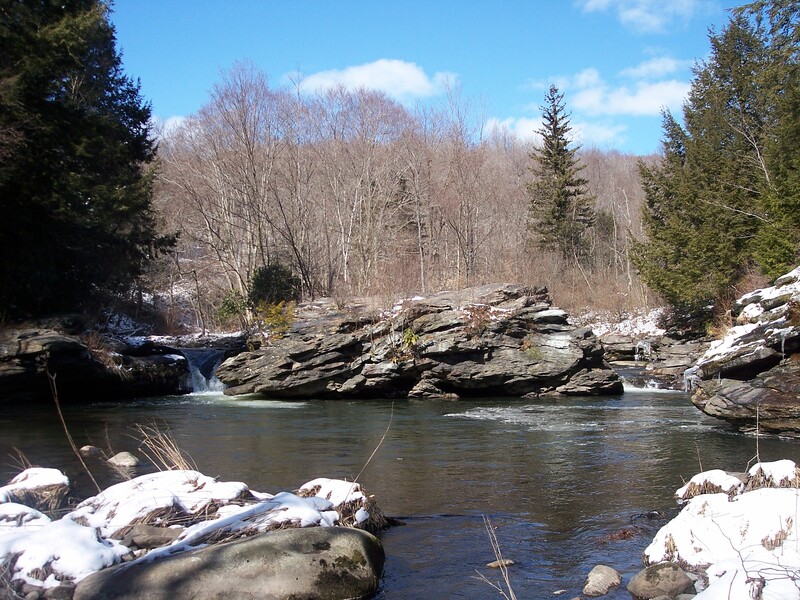 But it is famous for its trout fishing and widely recognized as one of the finest trout streams in the Mid-Atlantic. This is surprising considering the Lackawanna River’s bruised and exploited past. 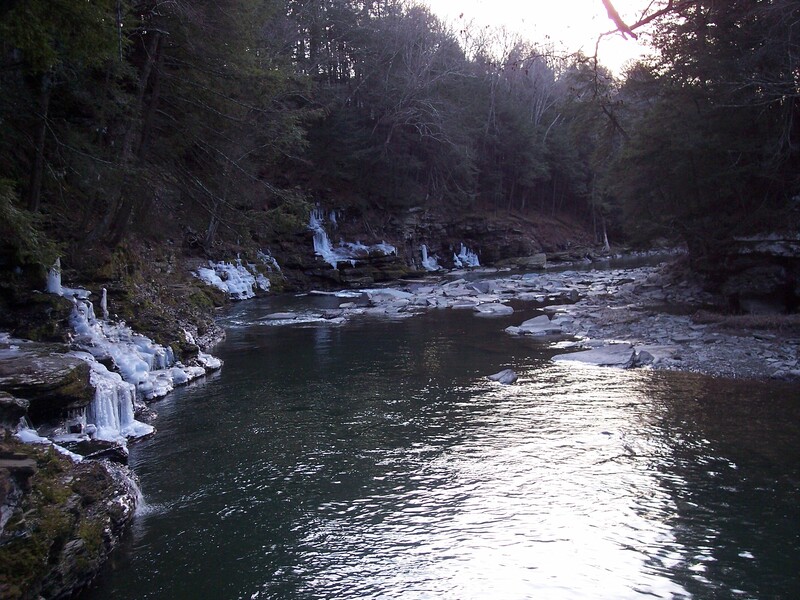 This upper section of the Lackawanna is quite scenic, with many rapids, deep pools, small cliffs, and hemlock forests. Old railroad viaducts cross the river, hinting at its industrial past. 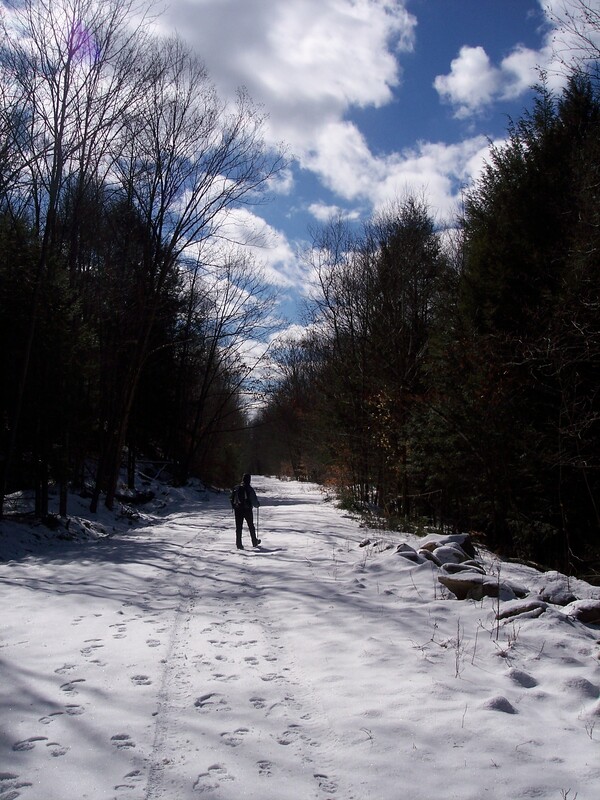 After a mile or two, we turned around as the white snow blazed under the crisp, metallic blue sky. When spring arrives, I hope to return. For more information about the D&H Rail Trail, click here. 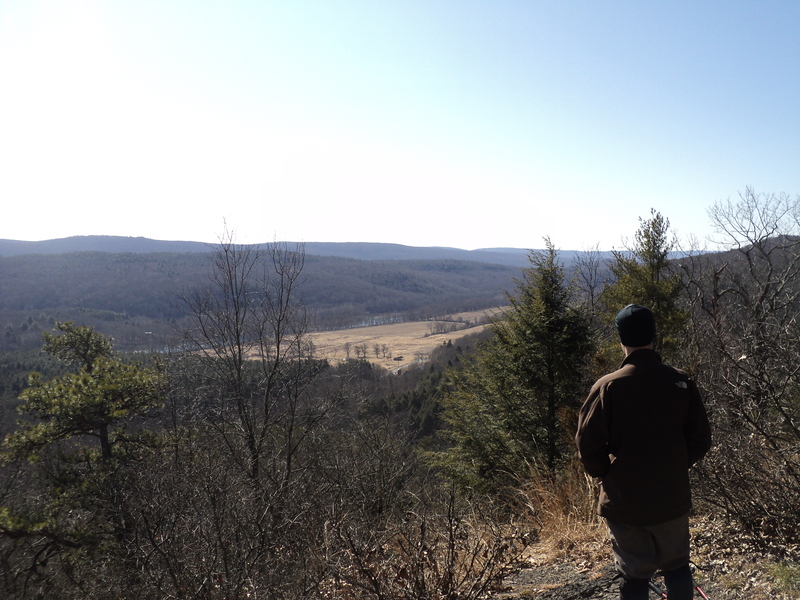 A few weekends ago I met up with some friends to hike the trails at the Pocono Environmental Education Center (PEEC) located in the Delaware Water Gap National Recreation Area. There are about 12 miles of trails that connect to each other, offering a variety of route options. 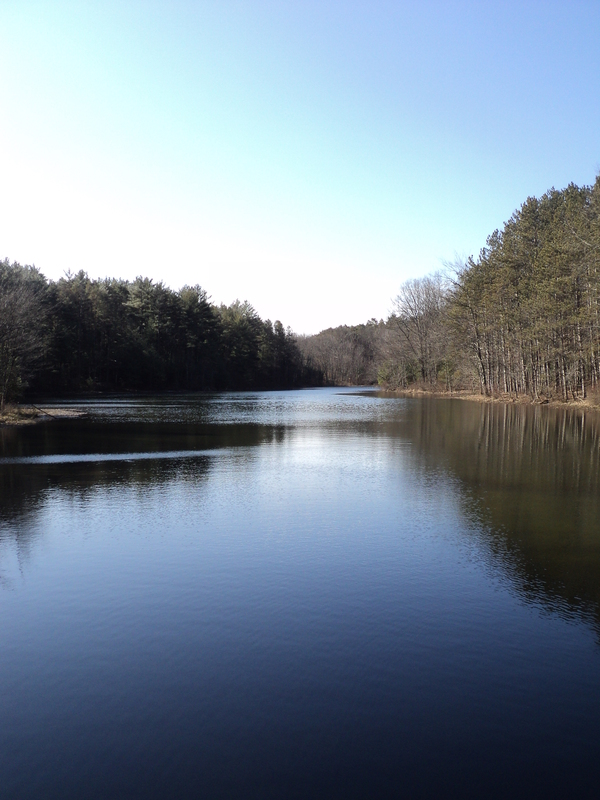 We began on the easy Two Ponds Trail, that passes, as it its name implies, two ponds, including the larger of the two, Pickerel Pond. The trails at PEEC are fairly well blazed, and are well established. Next was the Tumbling Waters Trail, probably the nicest trail at PEEC. The trail descends through a hemlock forest along a deep gorge. 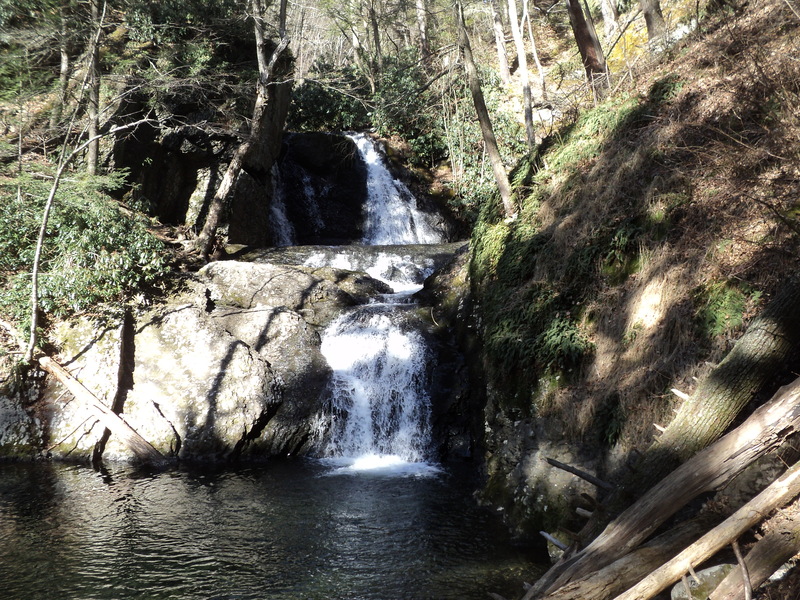 A side trail leads to a beautiful series of waterfalls that tumble into a pool. A higher falls is downstream and more waterfalls are upstream, off of the trail. The Pennsylvania side of the Delaware Water Gap is famous for its waterfalls, with these being one of many. Unfortunately, it was so sunny, my pictures of the waterfalls did not come out that great. 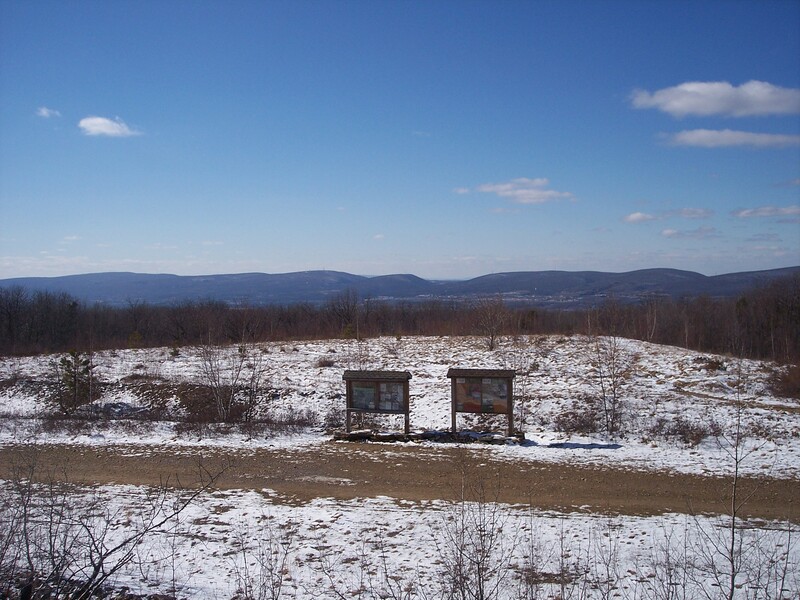 The trail then climbed along the ridge, offering many views across the Delaware River; New Jersey’s Kittatinny Ridge rose in the distance. 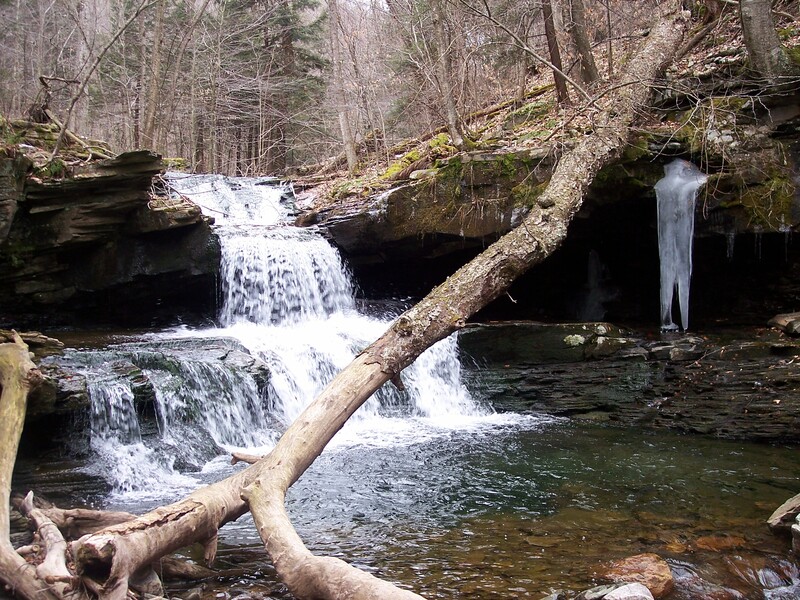 The trails here offer a lot of diversity, from waterfalls, hemlock shaded gorges, ponds, views, forests of hardwoods and pine, and even fossils. We followed the Fossil Trail as it descended to some fractured rock outcrops with shards of rock that had countless small fossils. The final trail we followed was the Scenic Gorge Trail. This trail entered a gorge along a stream with small waterfalls and cascades. The hemlock forest was battling the wooly adelgid, but they were still alive. 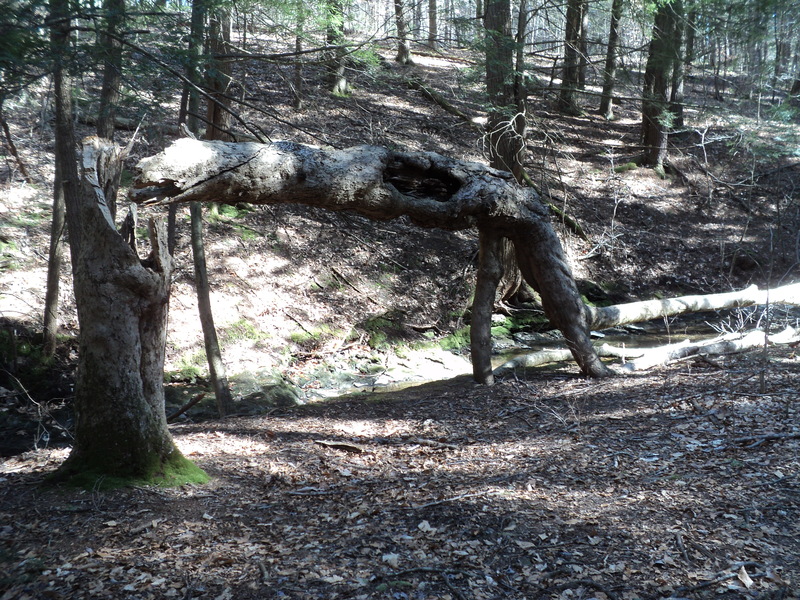 We then came across a fallen tree that landed on its branches and supported itself, to make it look like it was walking. We continued up along the small stream with its numerous cascades, framed by moss covered ledges. The trail left the stream and climbed through a drier oak forest, before returning back to the parking area. PEEC is a great place to take a hike. For more information about the trails, including a downloadable maps, click here. As the Meshoppen Creek flows towards the Susquehanna River, it has cut gorges that harbor a couple of waterfalls and rapids. 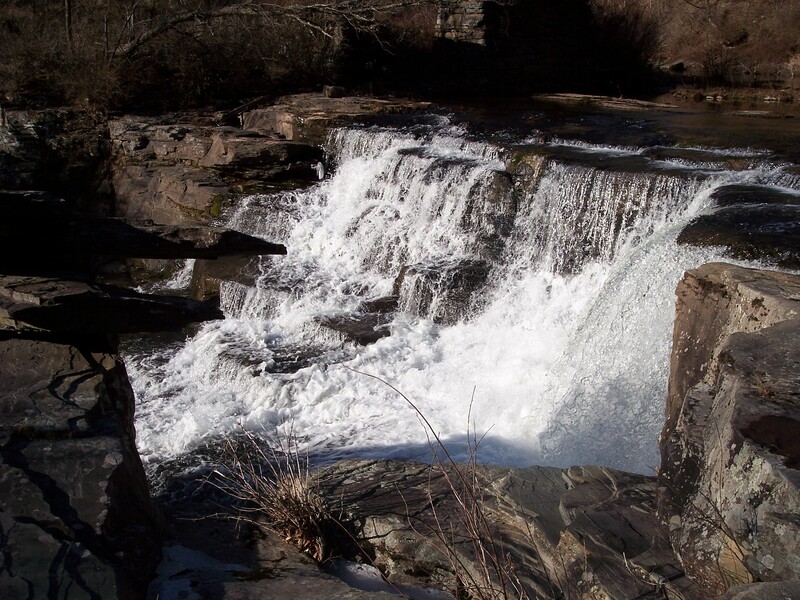 The highest of these is Slumber Valley Falls, located behind Slumber Valley Campground. The creeks cascades down about 20 or 25 feet into a huge pool surrounded by cliffs. Giant, smooth potholes have formed in the bedrock at the base of the falls; two are large enough to fit a couple of people, and so deep you cannot stand up within them. 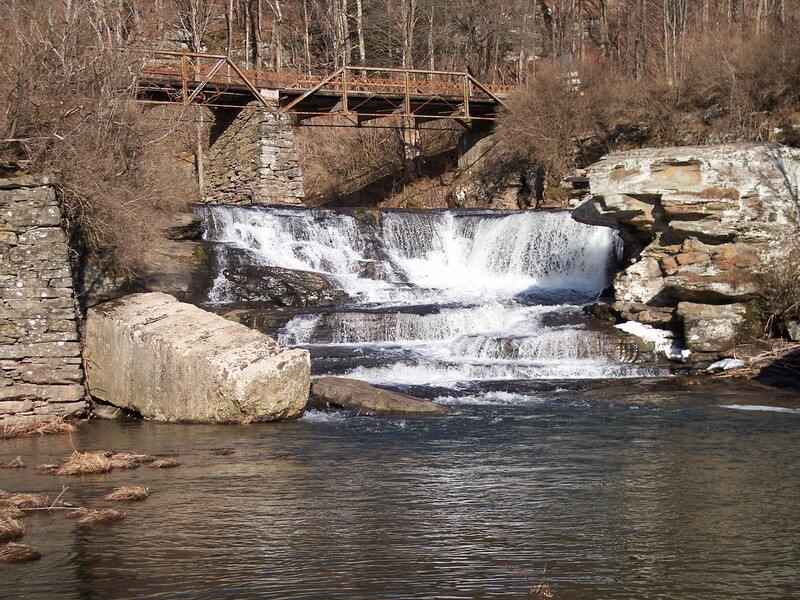 Considering their height and the substantial size of the Meshoppen Creek, this is one of the largest waterfalls in the area. Ice flows and springs were on the north-facing side of the gorge where there is a delicate waterfall from a cliff. On the hike down to the falls, there is another small waterfall that tumbles over moss-covered ledges. The falls are a beautiful sight and deafening in high water. The gorge is cloaked with hemlocks, and in summer, draped with ferns. For more information about Slumber Valley Campground, click here. 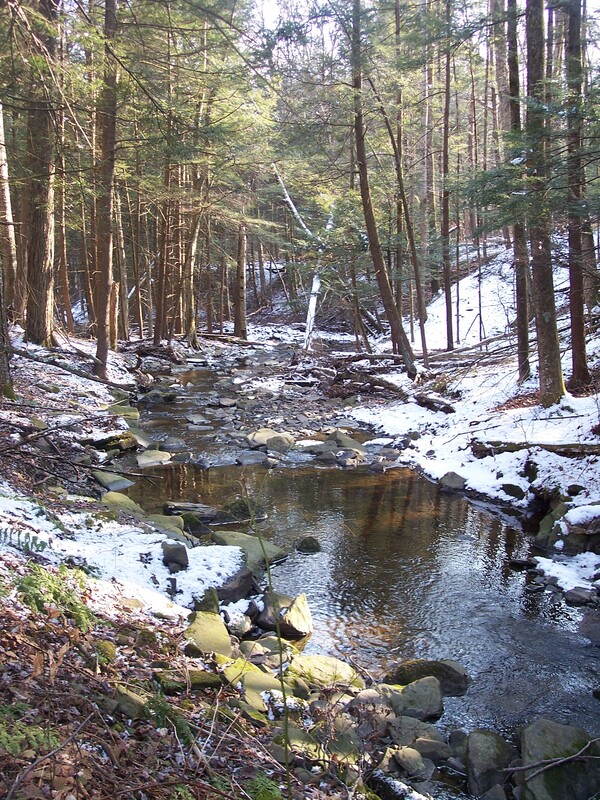 Woodbourne Forest, located north of Dimock, is the Nature Conservancy’s first preserve in Pennsylvania; it was donated in 1956. 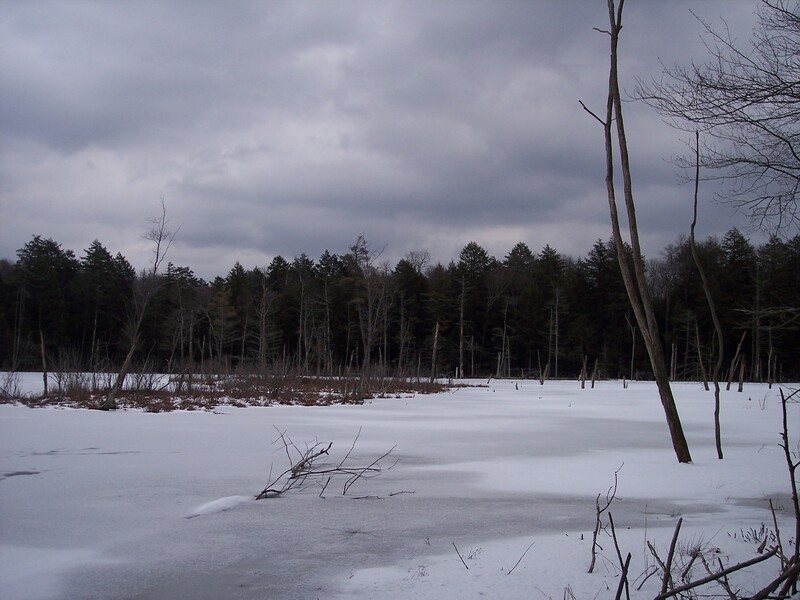 The preserve now covers over 600 acres, features about 8 or 9 miles of trails, and is home to an old growth forest of about 200 acres in size and two bogs. Streams wind through the preserve and form the headwaters of Meshoppen Creek. What makes this place so special is it’s life. The preserve is home to almost 200 species of birds alone, and hundreds more species of plants, insects, and other animals. 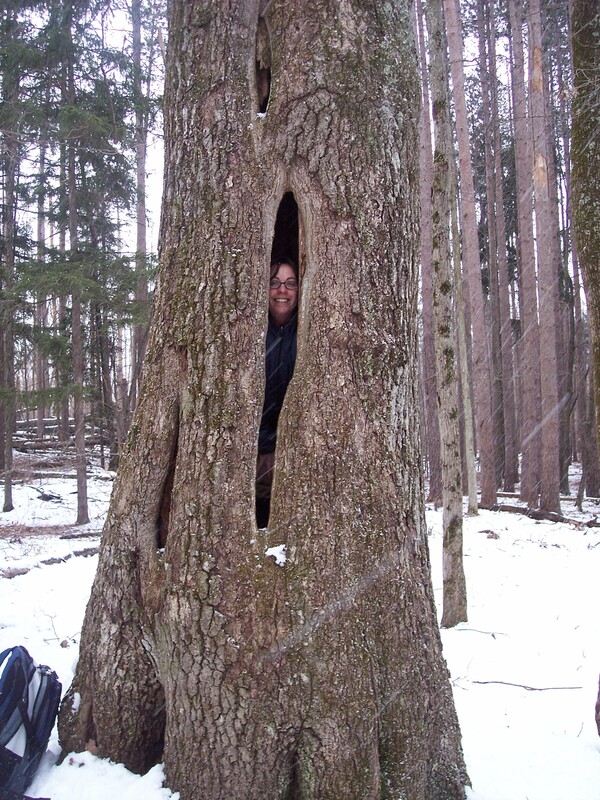 It’s old growth forest is the largest in northeastern Pennsylvania. Come here in the summer and the bog literally teems with life, with countless birds and animals. It is truly impressive. I visited on a cool February day. 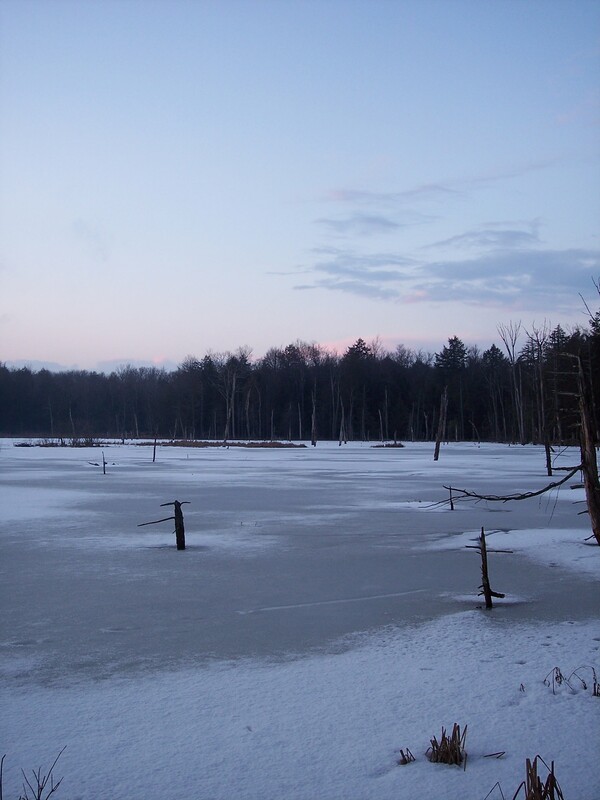 The bog was frozen over and snow powdered the forests. Sun would shine in between snow squalls. And we would still have a wildlife encounter by the end of the hike. We began by hiking the blue blazed trail, the longest in the preserve at about 5 miles. The trail meandered along the bog and then entered the forest with large hemlocks. Unlike in so many other places, the hemlocks here look fairly healthy. The trail gained elevation, offering views into the deep woods. It then dropped along impressive stone walls and down to the creek. The trail followed the creek as it babbled over rocks, under trees, and into pools. The blue trail went through some meadows, crossed a dirt country lane, and returned to the forest before cresting a hill with some partial views of the countryside. Here there were some massive oak trees that towered well over a hundred feet high with thick, muscular branches spreading a few stories above me. The trail descended, returned to the hemlock forest with more large trees and crossed some springs and small streams before entering a spruce grove and reaching another creek where I once saw otter slides in the snow. The trail crossed the dirt lane again and climbed under spruce before reaching the top of the hill. We passed another huge oak tree that was hollow, but still living, so Leigh Ann climbed in. The trail meandered through the woods as another snow squall arrived with big fluffy flakes that gently dropped through the forest. We arrived at a juncture with the orange trail, and took it to the right as it descended along a side stream under more hemlocks that were dusted with snow. We crossed the stream and proceeded up along it. We soon reached the outlet of the bog where there were three tiers of beaver dams. 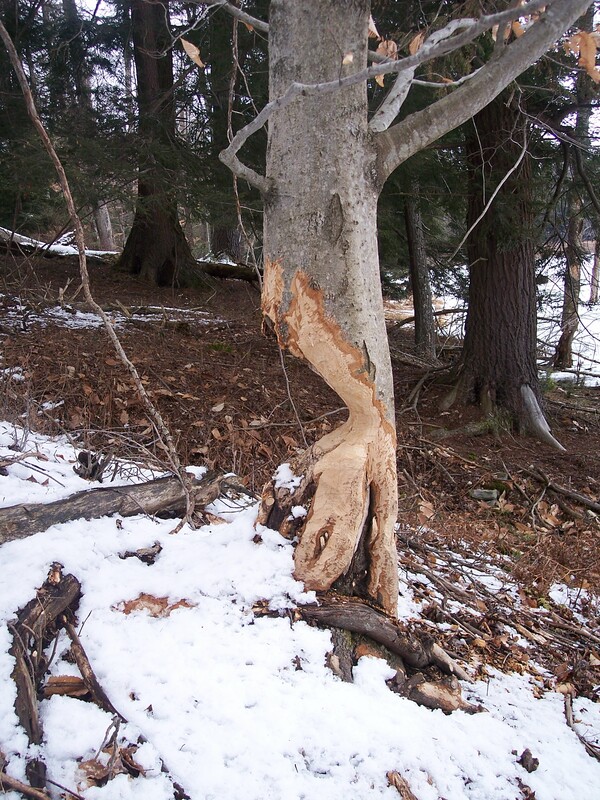 Beaver activity has increased at Woodburne over the years and they have been busy building and reconstructing their dams, raising the water level of the bog and ever flooding part of the trail. The top dam was the largest and was about fifty or sixty feet long. In the open water behind the top dam we saw a beaver swimming with its head just out of the water. Can you see the beaver in the picture below? The snow squall had passed and the sun was setting, creating a red glow in the sky. The only way to cross the creek was over the middle frozen beaver dam, so we gingerly stepped across hoping the beaver didn’t see us. We hiked along the shore of the bog, near the heart of the old growth forest which was dark and mysterious. 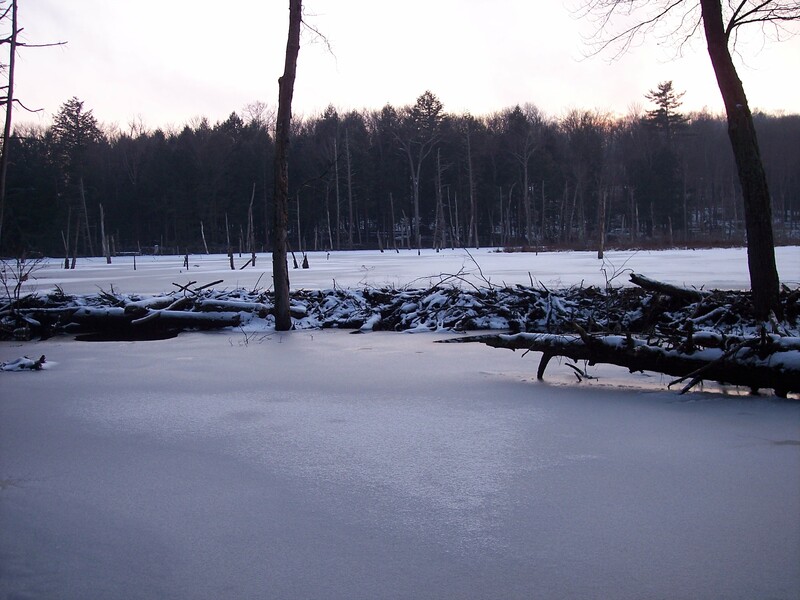 The ice was thick on the bog, so we just walked on it, but close to the shore. We returned to the car just as it was getting dark. Woodbourne is a beautiful place to visit anytime of the year. Although the trails are hilly and there are two stream crossings without bridges, they are perfect for kids. The yellow trail is best for small children. 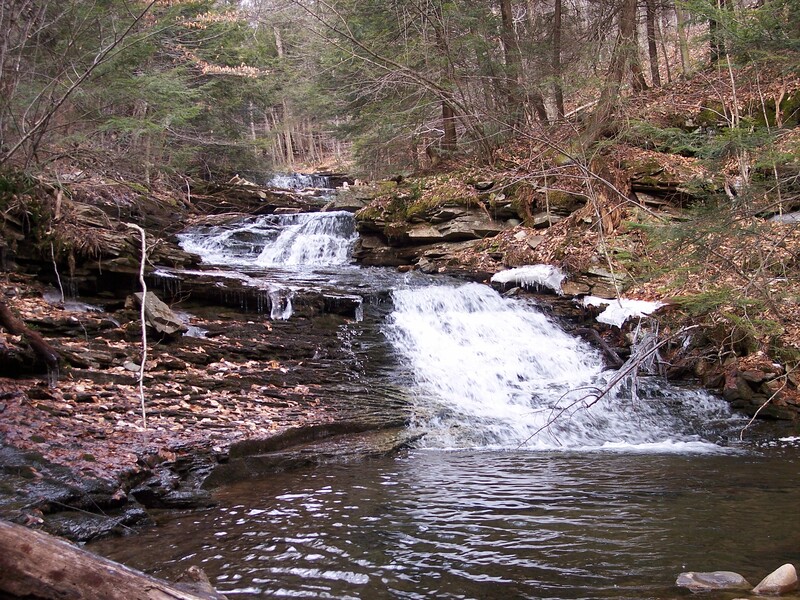 Located in SGL 159 north of Honesdale, just a short distance from a single lane dirt road is Tanners Falls. 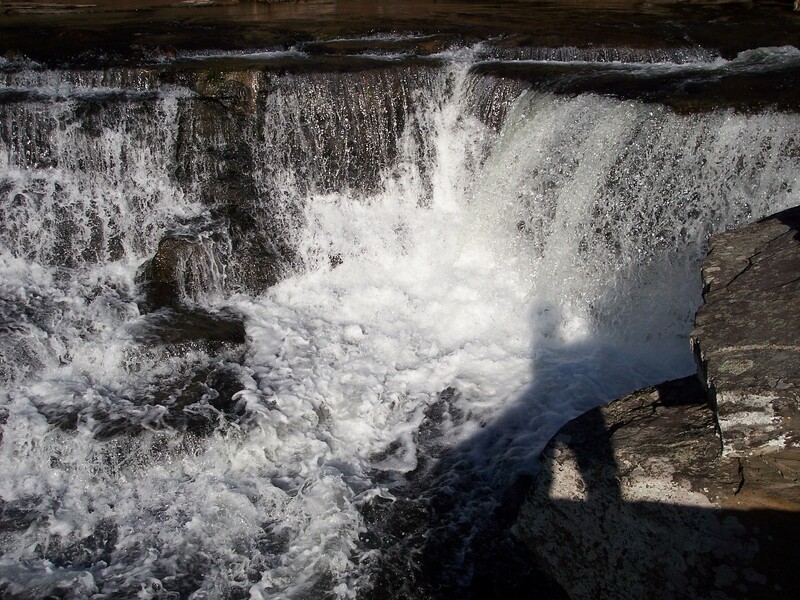 This falls is about 20 feet high and cascades down slabs of rock into a large pool. 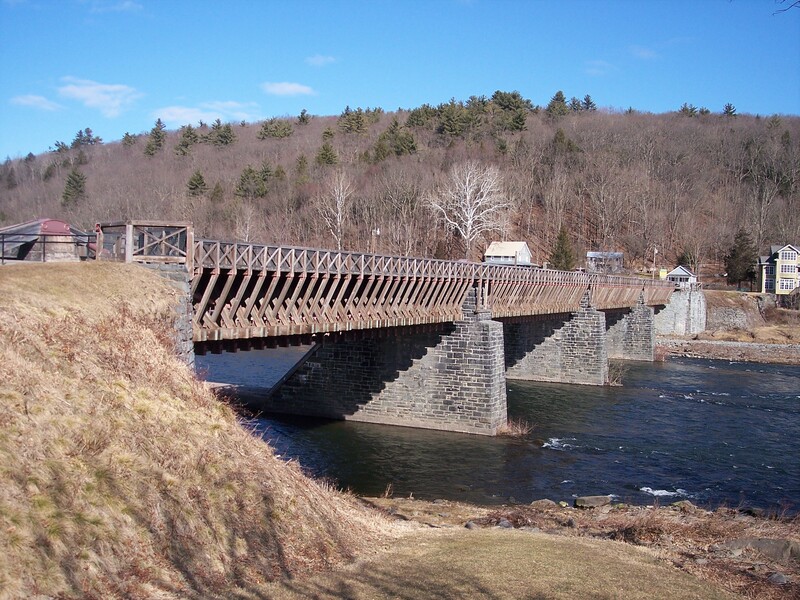 Above it is an old, and closed, metal and wooden bridge with fieldstone piers supporting it. This was a working falls, once home to mills. 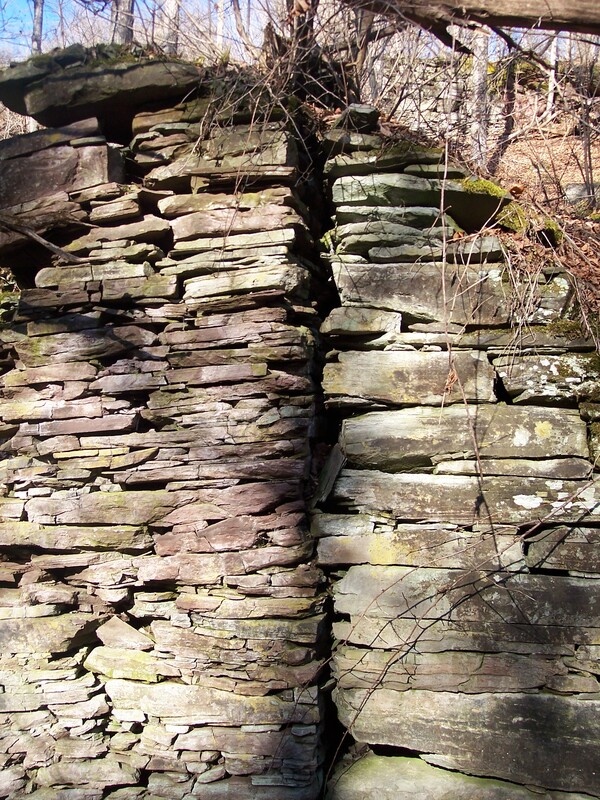 What is intriguing about Tanners Falls are all the old stone walls and fieldstone footers that create a labyrinth. These used to support mills, no long gone. The walls are draped with moss and partially concealed by brush. The stoneworks have even been built into the side of the hill. Another view of Tanners Falls. Prior to going to Tanners Falls, we stopped by the pleasant hamlet of Lackawaxen; the drive along the Lackawaxen River is very nice. We saw the Roebling Bridge, a suspension bridge designed by John Roebling. It is the oldest remaining wire suspension bridge in the United States. This bridge, also known as an aqueduct, was built to carry a canal over the Delaware River. Now it carries lighter traffic. Roebling would go on to design a slightly more famous bridge, the Brooklyn Bridge. 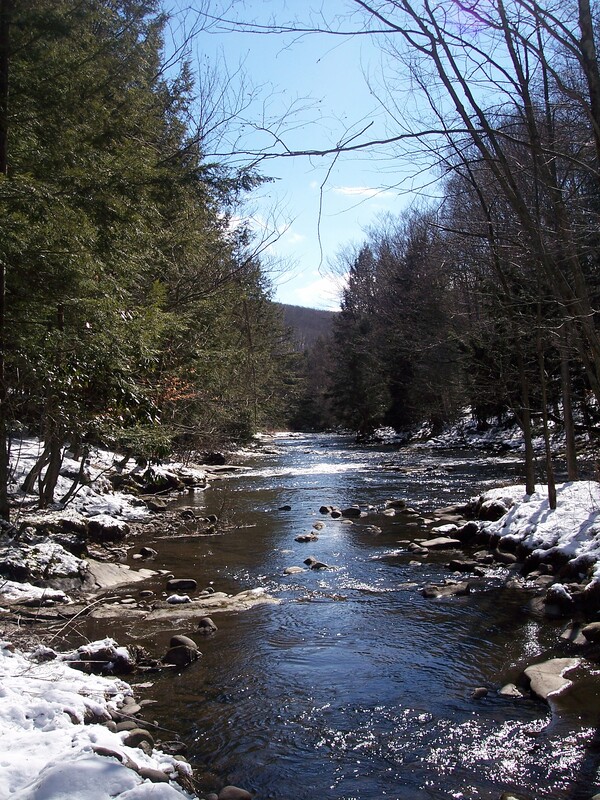 I returned to Quinn Run this past weekend to scout a route to Muncy Creek. 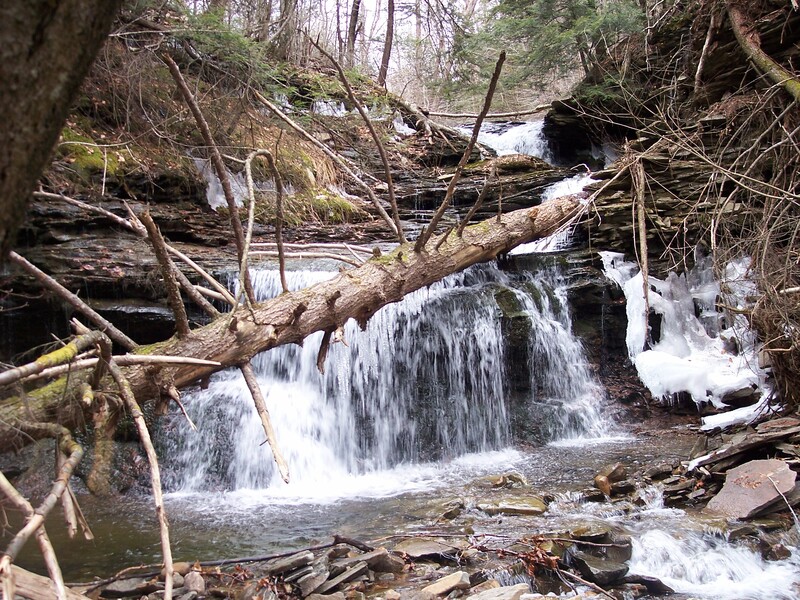 I hiked up Grassy Hollow Road and heard the roar of Big Falls, which were out of sight. I soon passed Twin Falls and left the gated road at Lewis Falls. Thankfully, the creeks were much lower on this hike, so I was able to cross without much problem. I hiked up an unblazed trail, turned left onto an overgrown grade, and soon I was at the junction of Quinn and Shanty Runs. My route was to follow Quinn Run. The run has carved a deep and rugged glen with several waterfalls and numerous cascades. In other places, the creek flowed around many small boulders. I crossed where I needed, but to my surprise, segments of old grades followed the creek closely. Ledges and small cliffs would rise over the creek. As I continued, the glen became even steeper, similar to Dutters Run along the Loyalsock Trail. I soon reached a remarkable grotto surrounded by ice flows and hemlocks. Ahead a three tiered falls, about 20 feet high, the highest falls on Quinn Run. It was hard to get a view of this falls since it was embedded between the ledges. A tree fell in front of the bottom drop and crystal clear icicles clung underneath. I scrambled around this falls to encounter another one above a series of smooth bedrock slides. More waterfalls were above, announcing thier presence. This was like a mini-Ricketts Glen. 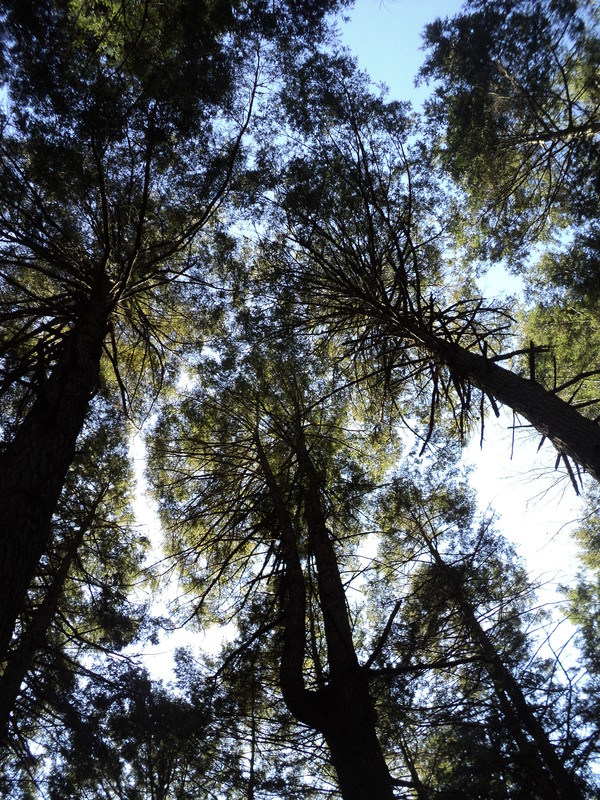 The surrounding forest had some large hemlocks, almost looked to be old growth. I then reached an impressive stairstep of three waterfalls. I passed one more small waterfall that fed a large pool and hiked through a verdant hemlock forest. I then crossed a small meadow that reminded me of the Quehanna as crystal-clear Quinn Run babbled in its meandering channel. More impressive hemlock forests followed with moss and ground pine. It was very beautiful. I found a gated grassy forest road and bushwhacked to a dirt road near the game commission parking area. I then hiked down to the headwaters of Muncy Creek. The forest here was incredible- mounds of fluffy sphagnum moss, ground pine, old hemlocks- it was so dark and green. It was tough to find the creek at first, as it flowed silently between trees and through calm pools. Soon, a creek bed formed and I followed it to Robinson Road, the end of my bushwhack. But there was still a lot more hiking to do. I followed the dirt road and turned left back onto Grassy Hollow Rad and hiked that down. This road appears to be closed, and it made for a very nice hike. Heberly Run soon came into view and it was a beautiful creek with small waterslides and rapids, linked by deep, aquamarine pools. Below Meeker Run, a side stream, there were several 4-5 foot waterfalls and curving waterslides. The old road was well above the creek, but there were great views since the leaves were off the trees. 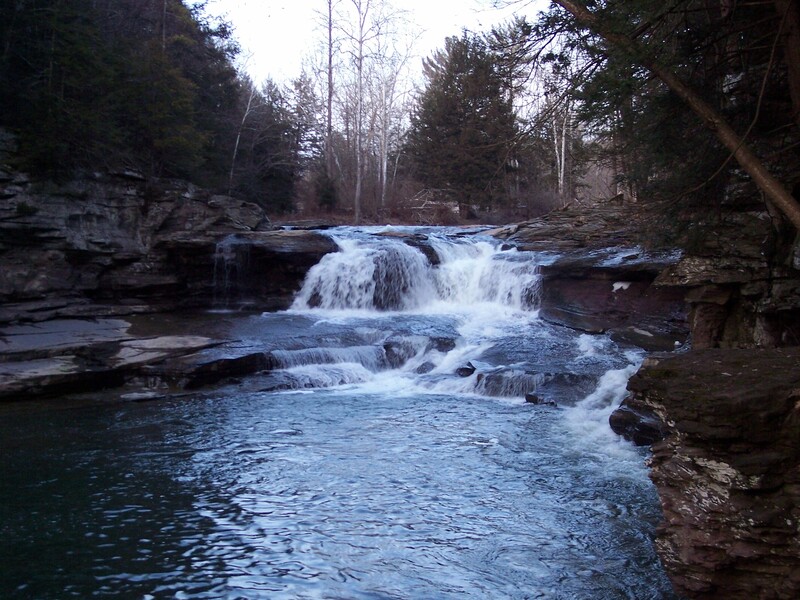 Heberly looks to be a great creek to hike in summer with all its waterslides and pools. I reached my car as the moon began to rise. 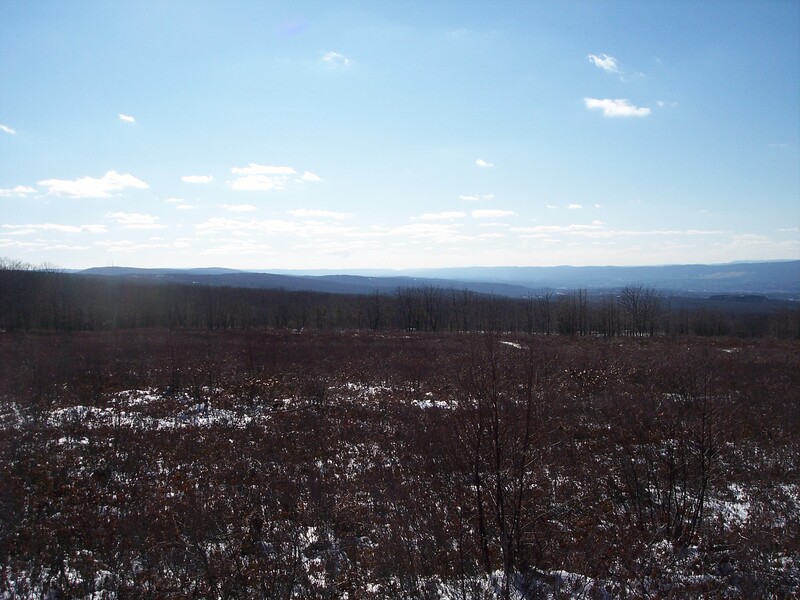 I hiked about 11 miles and was able to see another incredible place in Pennsylvania.